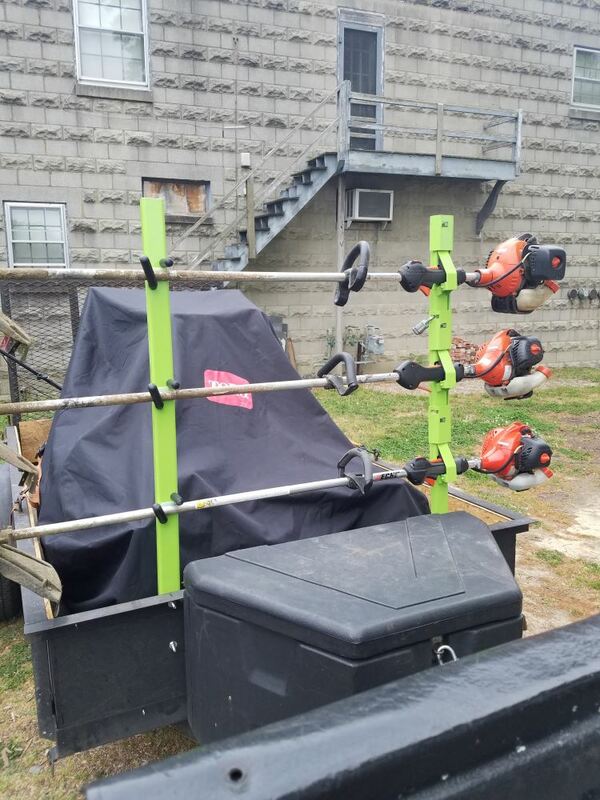 Storage rack for open utility trailer holds up to 3 trimmers. 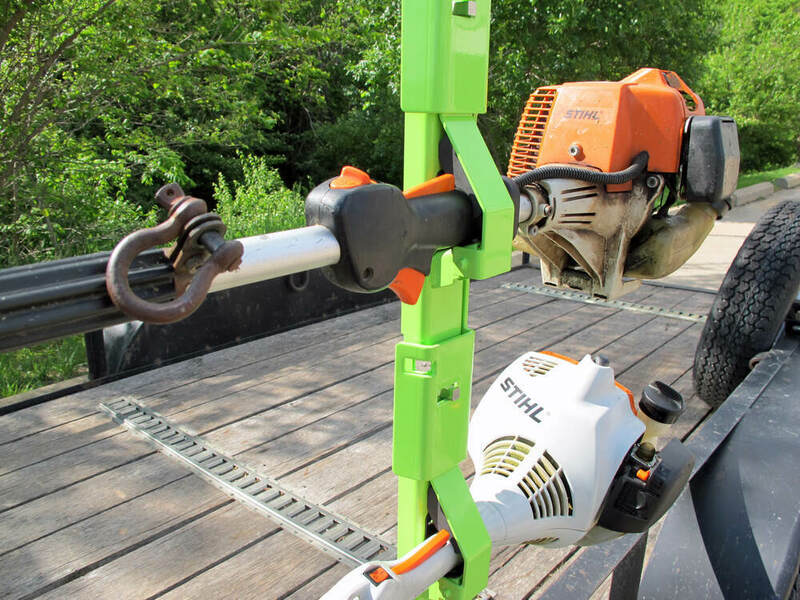 The trimmers sit horizontally in padded hooks and are secured by a single, lockable security plate (lock sold separately). Individual clasps allow you to remove 1 trimmer at a time. 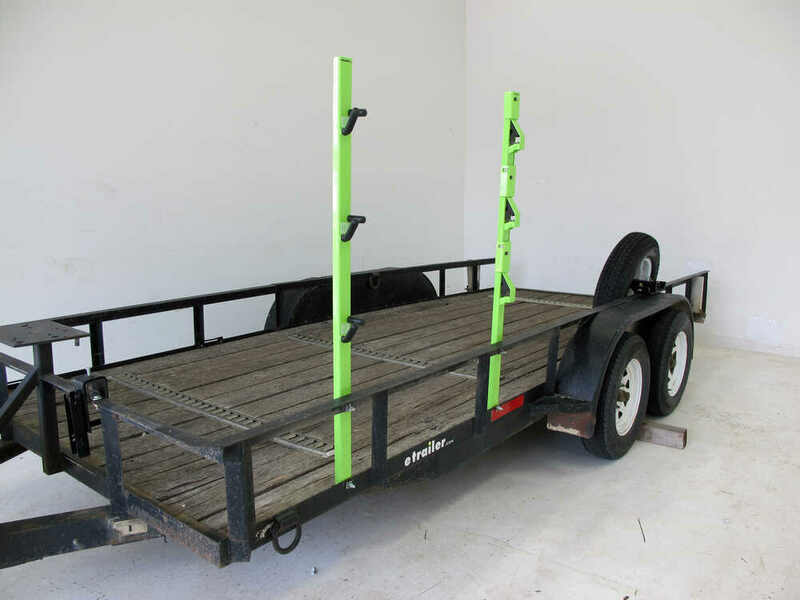 Lowest Prices for the best trailer cargo organizers from Phoenix USA. 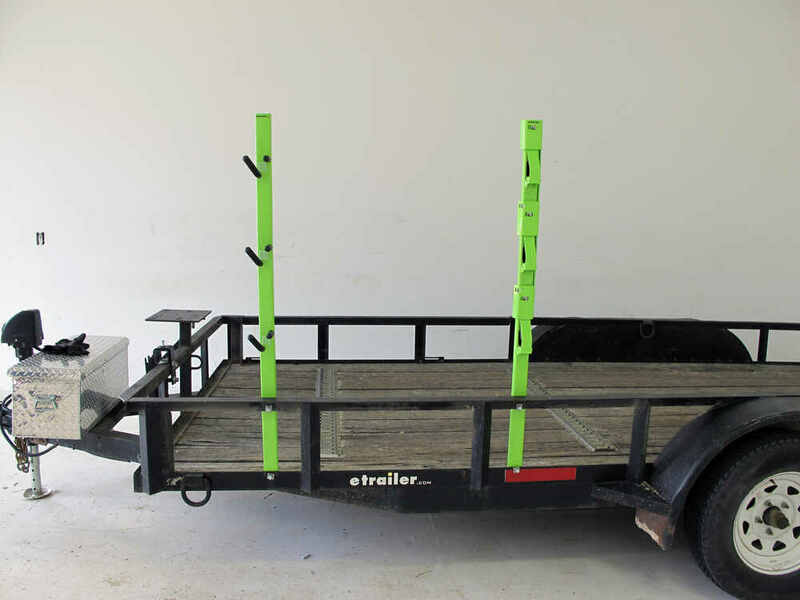 Tow-Rax Trimmer Rack for Open Utility Trailers part number PXSPDDTR3 can be ordered online at etrailer.com or call 800-298-8924 for expert service. 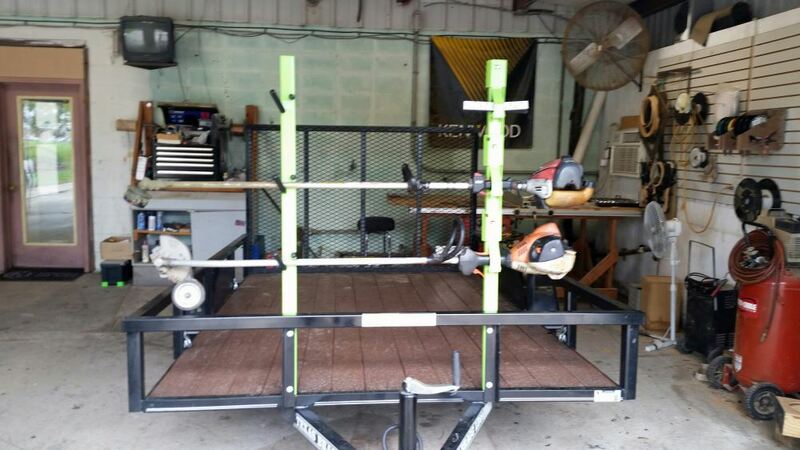 Storage rack for open utility trailer holds up to 3 trimmers. 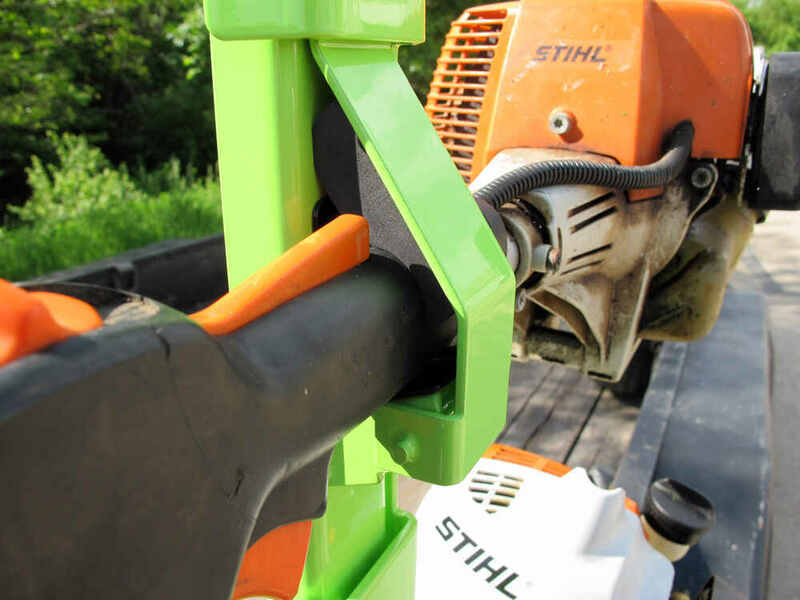 The trimmers sit horizontally in padded hooks and are secured by a single, lockable security plate (lock sold separately). Individual clasps allow you to remove 1 trimmer at a time. 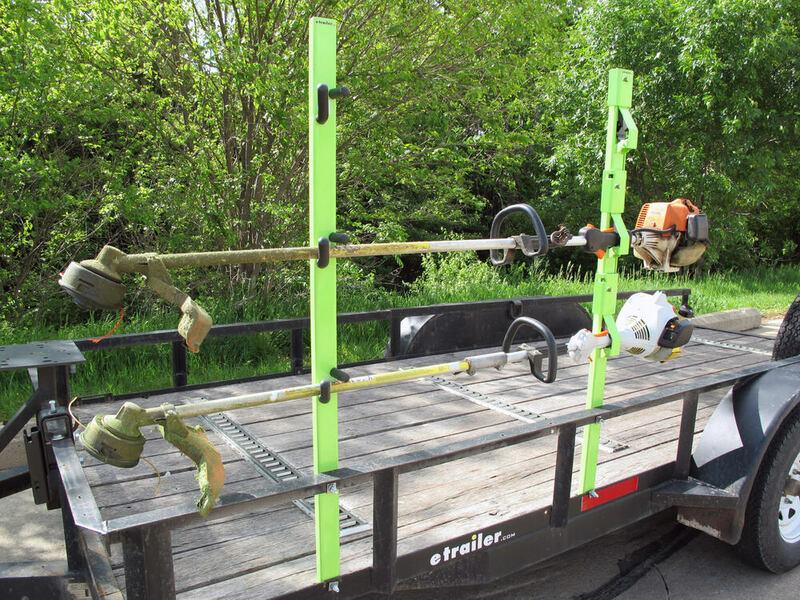 This sturdy steel rack installs to the bottom rail of your open utility trailer and holds up to 3 trimmers or weed wackers. 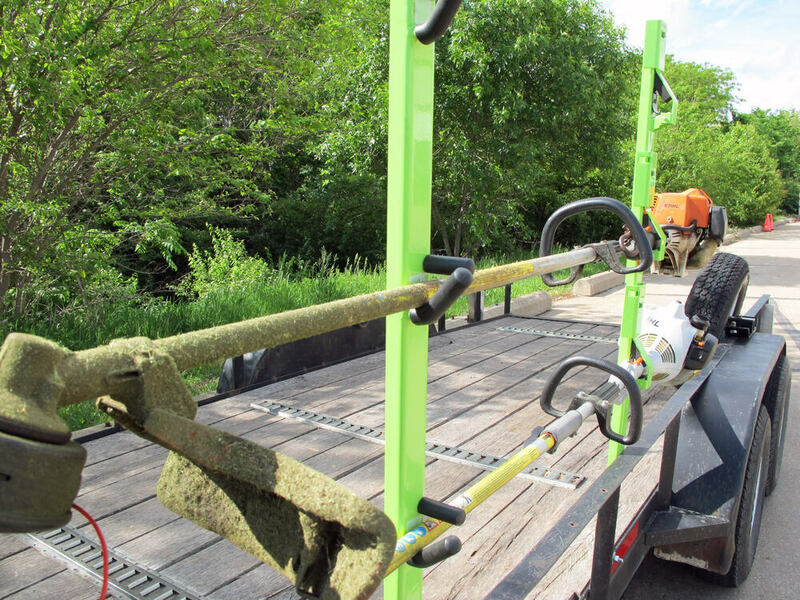 During transportation, a lockable plate slides into place to keep all the equipment secured and deter theft. When the plate is not engaged, individual clasps keep the trimmers in place until you undo the latch. 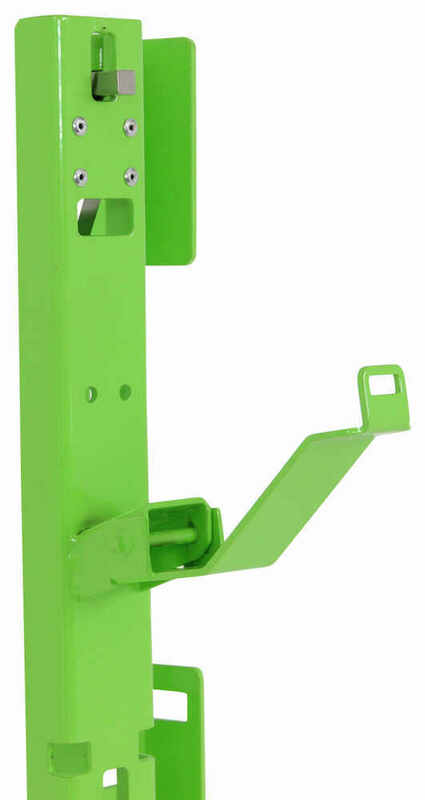 The individual latches allow you to remove one trimmer without releasing the others from their stored positions. Foam pads cradle the trimmers at contact points to prevent damage and rotation during transport. 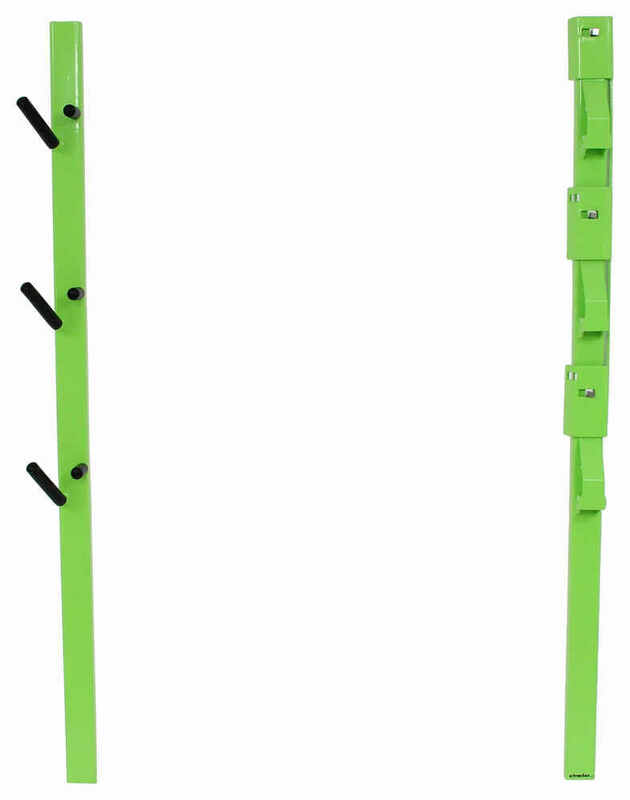 The rack itself is made from durable steel while the latches are rustproof stainless steel. 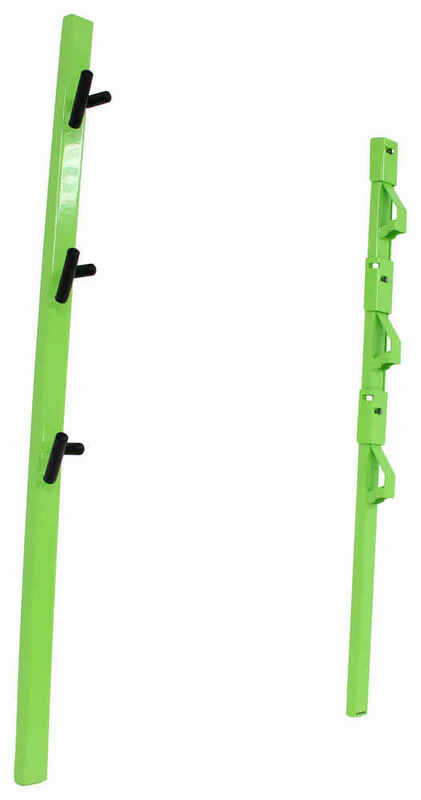 The entire structure is powder coated for further corrosion resistance and is painted green for visibility and safety. 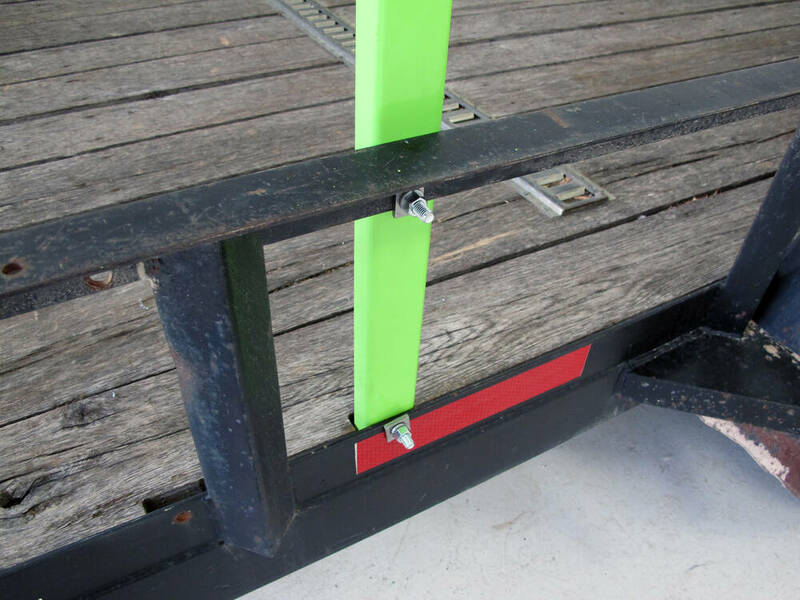 The rack installs to the side rails of your flatbed trailer and requires minor drilling. 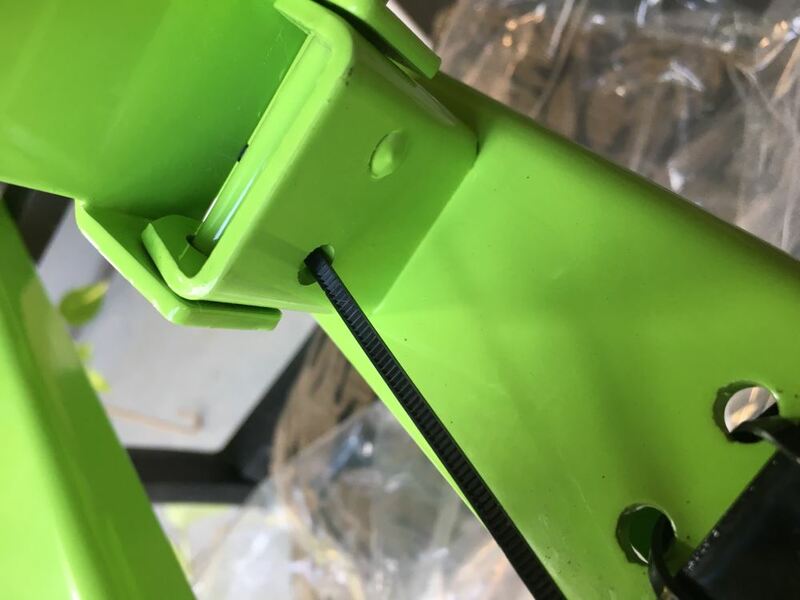 In order to mount the trimmer rack, you will need (4) 3/8" diameter bolts, (8) flat washers, and (4) lock nuts with nylon inserts (not included). 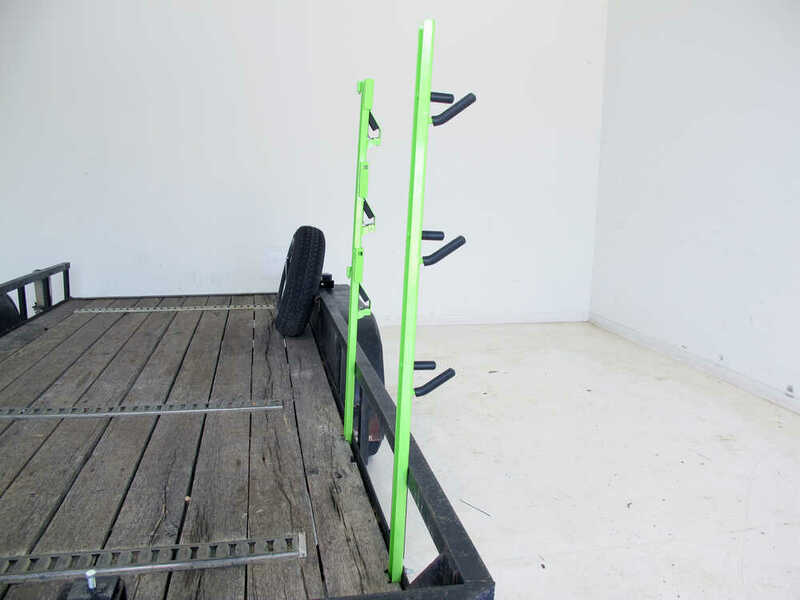 Carry up to 3 trimmers simply and securely with this expandable trailer rack. 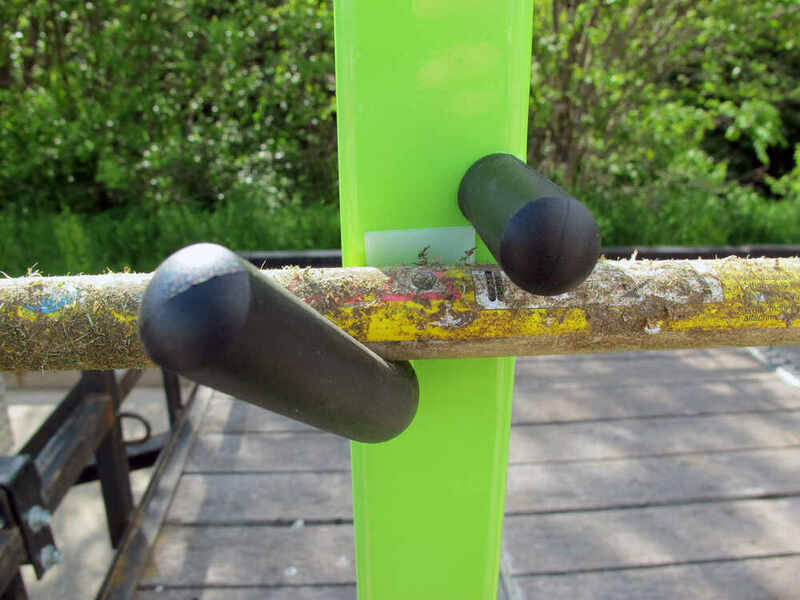 Pre-drilled posts attach easily to the supports of your open utility trailer. The 3 included padlocks are keyed alike. 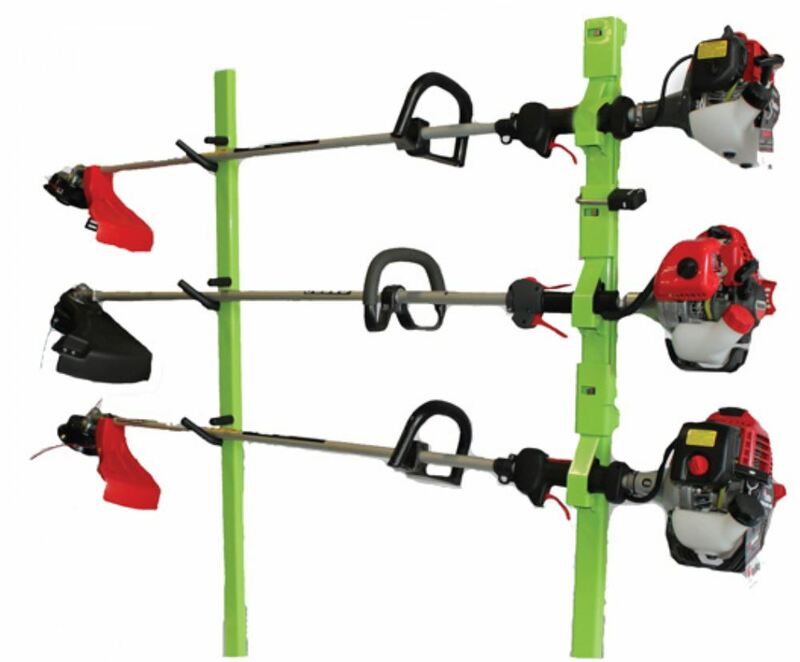 The weed eaters sit horizontally in the rack. 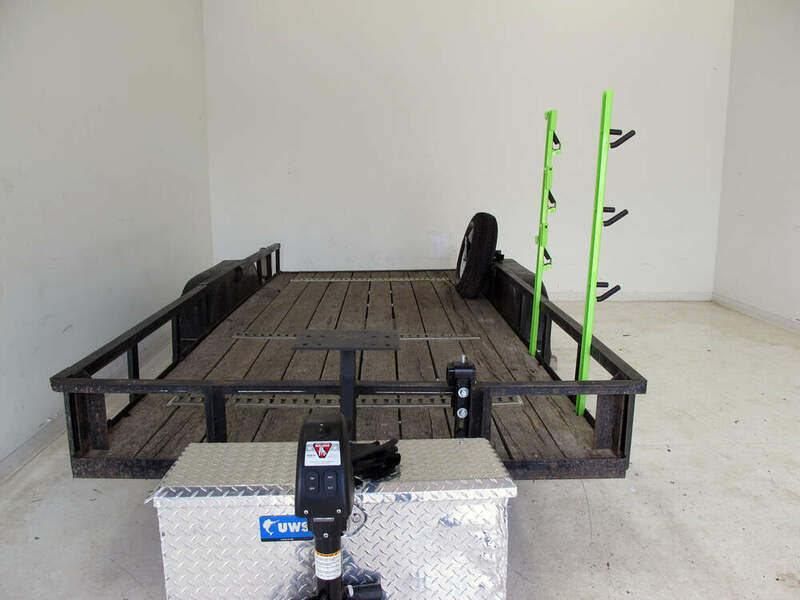 Today we're going to be taking a look at, we're also going to show you how to install the Tow-Rax Trimmer Rack for Open Utility Trailers. Part number is PXSPDDTR3. 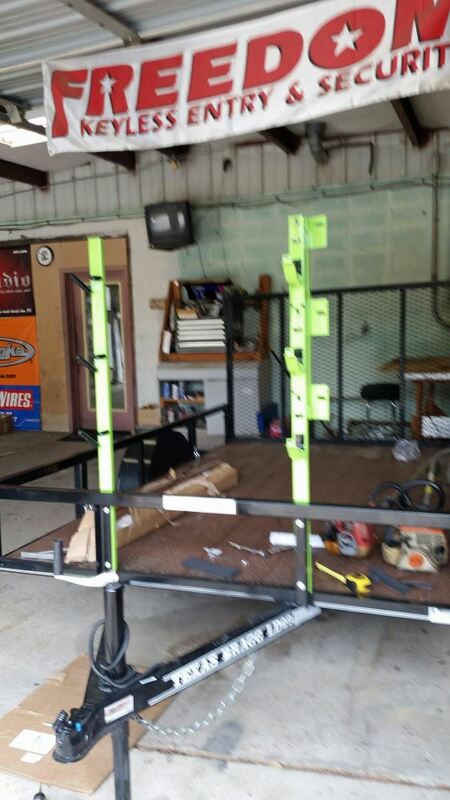 Here's what our rack's going to look like installed. As you can see we're going to have 3 positions here that are going to help hold our trimmers in place. The thing that's really convenient about this is we only need 1 lock to secure all 3 locations. 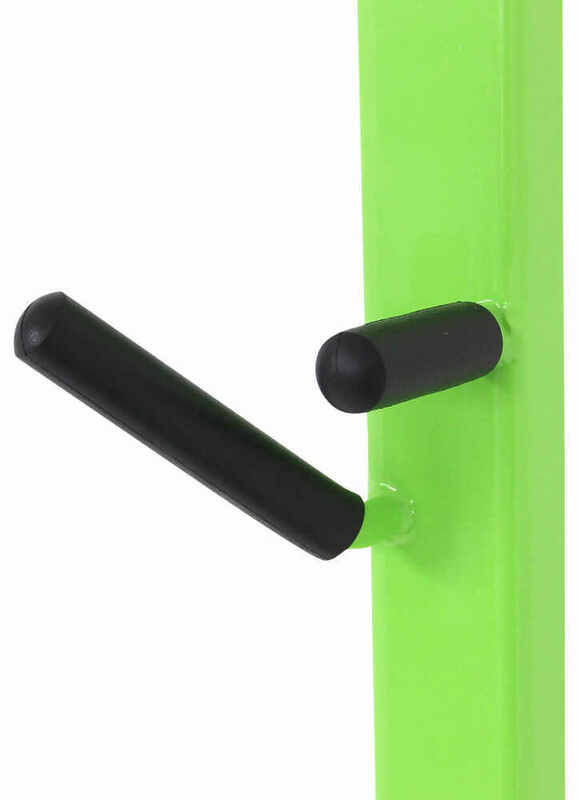 You can see we've got a door that's designed to come over, and not only does it prevent us from moving our latches up and down, it's also going to prevent the door from being opened. It's a really nice secure system. We can use, again, a single lock in any of the connection points. We've got 1, 2, and there's a third back here. 5/16 inch diameter shackle is what we're looking for. We recommend part number ML1KA. It'll take care of getting that locked up for you so you won't have to worry about it. Once we open this up we're going to see our stainless steel latches. All we have to do is pull up on those, that's going to come right out as you can see. We won't have to worry about our trimmers falling, we've got a nice area there. These are really nice and protected as we're heading down the road. We've got our grip pad here. Going to have an additional pad here. As we close this it actually squeezes that trimmer into place. I feel like by that squeezing that trimmer into place it's going to give us a really nice quiet, secure ride so they're not always going to be bouncing around back here behind us. We go up to the front, same things in place here. We've got our rubber cushions that come down both on the top and bottom. If we look just inside there, there's going to be a really heavy duty pad to prevent our shaft from rubbing up against the rack itself. 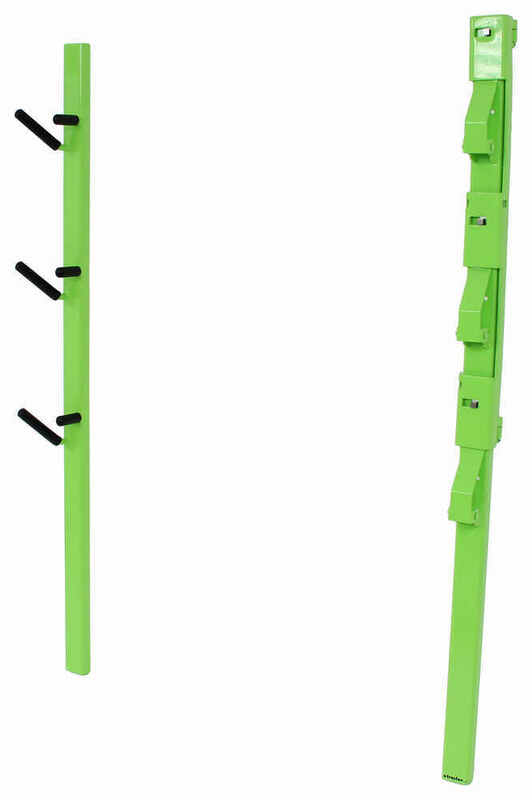 Now, other than having 3 different locks to lock 3 different trimmers, one of the chief complaints that we typically see with other styles of trimmer rack is that, if we want to get the one in the middle off, or if we want to get the one that's in the bottom off we have to take off the one above it. That could sometimes lead to removing the 2 top items just to get to the trimmer that you've got on the bottom. That's not an issue with this style. Just pull up, release that. Then it's just a matter of rotating it down and out just like that. As you can see, we're going to be able to get this on and off regardless of what's in position above it. That can save us a lot of time when we get out there on the job site and a lot of fumbling around with different pieces of equipment. 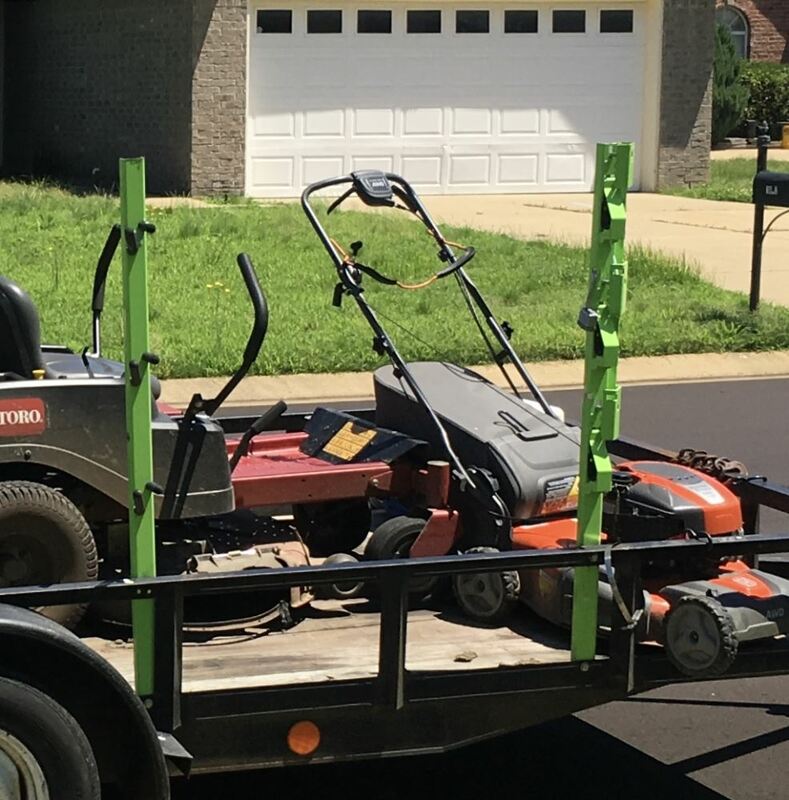 As a great added bonus of all the protective features here at the front and on the back that are going to keep our trimmers from having any kind of damage, it also keeps it nice and quiet while we're heading down the road. 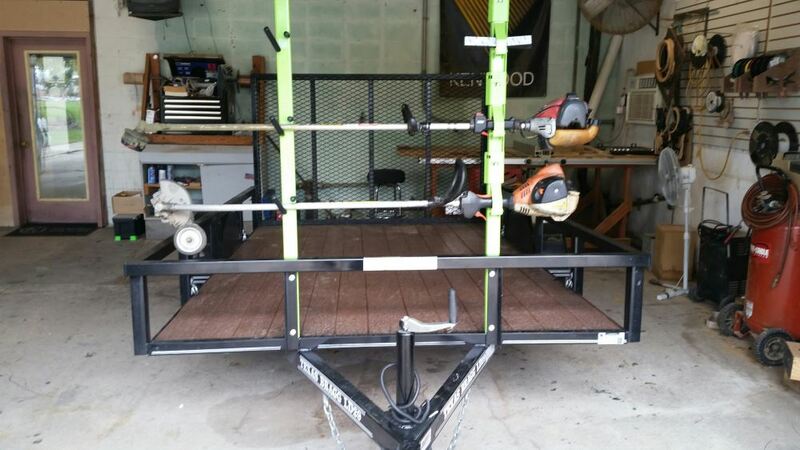 There's enough noise coming from the trailer, we don't need our trimmer rack adding to that. 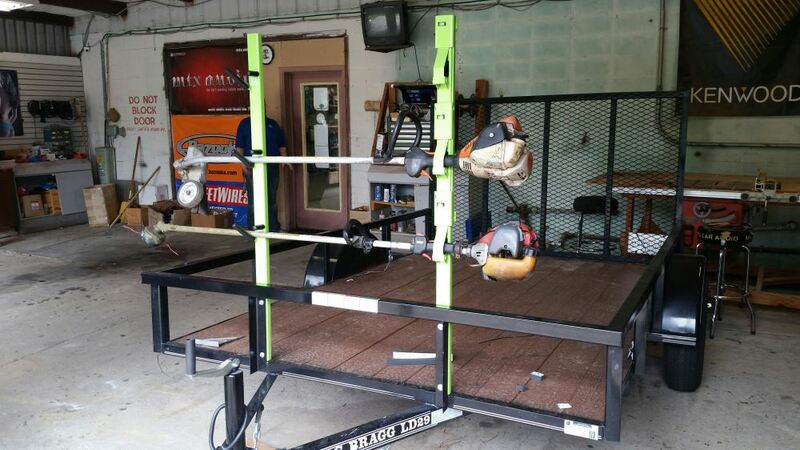 The rack's made of a nice heavy duty gauge steel that you can see, it's going to be very durable. We've got a bright powder coat finish on here. That's going to give us superior corrosion resistance, and it also helps out with visibility so we won't bump into is as we're going around the trailer. This is a very versatile application. So far we've installed them on trailers that had square tubes on the outside, that had angled iron like this, or even round tubes. We're going to be able to get our attachment point at the bottom here and at the top regardless of the situation. We just want to remember we will need to provide our own 3/8 fasteners at least grade 5. We want those to be whatever length we're going to need to bridge the gap across whether it's a square, round tube, or angle like what we've got here. We've got our gap here about at the minimum of where you want to be. This is about 10 inches. It looks like going up beyond that we'd be able to get to about a 16 inch rail before it might start interfering a little bit with this bottom drawer drop down, so you definitely want to keep that in mind. It looks like from where our handle rests to where our other handle rests it's going to be right at about 12 inches. That's giving us a lot of good spacing in there, plenty of room for things to get in there and maybe we won't have to worry about the exhaust on one discoloring the other one. Up here at our shanks it's going to stay just about the same, about 12 inches from the center of where that one sits to the center of where that one's going to sit. Our uprights themselves are going to be about 2 1/4 inches wide. They're about 1 inch thick. They're going to have a total height of about 52 3/4 of an inch. The area here where the shank of our trimmer goes through, that measures at about 1 1/4 inches. As long as the shaft on your trimmer doesn't get larger than that, it should work in here perfectly. The area where our handle sits is going to have a tolerance of about an inch and 3/4. If you've got a really large diameter handle it might be kind of tough to get it in there, but at least anything under an inch and 3/4 should go in there without any kind of problem. Now we'll take it around the parking lot a couple times here, bounce it around and see how it would work on those city streets. The first step in our installation is going to be to decide where we're going to be mounting our hangers. You want about 36 inches center to center with your spacing between your 2 uprights. We want the one with the locks to be towards the right. Either it's going to be in the front if you're doing the passenger side, it's going to be in the rear if you're doing it on the driver's side here. Once we've decided where we want these to go we want to drill 2 3/8 diameter holes, or maybe go a 32nd larger if you want to, through our trailer. You can see we've got 1 hole right here. Directly above it we've got a hole right here. We have notched out the bed of the trailer a little bit, this seems to work really good. What you're going to do is use maybe a 1/2 inch drill bit, drill straight down a couple times, and then just kind of knock that out. That'll allow for our upright to slide right down in behind there. Want to get it pretty centered. Then we typically just use a clamp just to kind of get it held into position here. 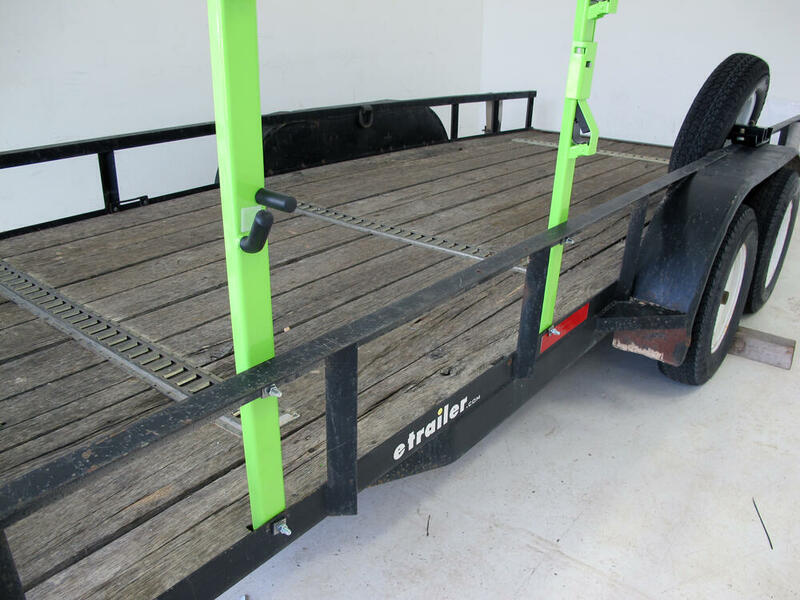 As long as your trailer is sitting level you can check the side of this and make sure that it's level. Once we've gotten it leveled out, what I'll do is take my bit, go in my hole, and then push it against the arm itself. That's going to give me a perfect center location so I'll know where to drill my holes. I'll do the same thing for our front. Now I'm going to use a slightly smaller bit, which I typically do any time I'm going to drill a hole larger than a 1/4 inch. Make a pilot hole first, and then we'll drill it out to our 3/8 diameter. They recommend using at least 3/8 hardware, that's why we've made our 3/8 diameter hole. We're using just a little square washer. You can use a 3/8 round washer. We're using a locking washer and then we're putting a nut on. Really simple. You're going to need 4 of each of these, so keep that in mind; hardware's not included with our rack. You want to be sure you have these on hand so when you get it you're not surprised by it. What I'm going to do is just slide the bolt through upper or lower. The upper's going to give you a little bit more stability. Drop it down into position here. We can allow our bolt to come through our hole and slide on our washer, slide on our lock washer. We're going to do this at all 4 hole locations. Now to get our rack prepped for use we want to open up our lockable cover there. Going to open up our latches here. These are our grip guards. What these are going to do, is they're basically going to sit right in here and just kind of make a little U there. We'll line the circular holes up with the holes here in the top. We'll pass our zip tie through, bring it around and go back through. Then we'll just secure it here in the back. Keeping the head of the zip tie or the hole on the zip tie back here will keep it from getting hit on our trimmers or anything. We'll trim that off down low. Now just by pushing on that with our thumb we'll be able to get our other one in. The zip ties we'll need to do this are provided, so you won't have to worry about trying to find little thin zip ties or anything like that. We'll just take care of that at all 3 of our locations. Now we'll take 1 of our prep pads and we're going to clean off this area in between our 2 rod hangers or where the main tube of the weed eater is going to sit in there. We're going to clean that our. They've actually provided us with some protective pads that are going to go in there. They're real sturdy, it's not something that's just going to wear off in just a few days or anything like that. Real nice heavy duty thick clear part there. That's just going to be positioned just like that. I think it is nice of them to provide this type of material, that way it'll protect our trimmers from hitting up against that metal protecting both the rack and the trimmer itself. Now we can take our foam block here, and we're going to cut this into roughly 2 1/2 inch sections. 2, 5, 7 1/2. We'll use those 3 to further protect the handles of our trimmers. Now we're going to grab another one of our prep pads here and we'll clean off this inside edge at our 3 locations. Give that plenty of time to evaporate off and then we'll apply our blocks to it. Now you want to press down firmly on that for about 30 seconds to make sure it gets a really good adhesion. Now we can close our doors back up here. That's all there is to it. Get our trimmers and load it up. With all of our hardware torqued down we're ready to load up our trimmers and we can hit the road. 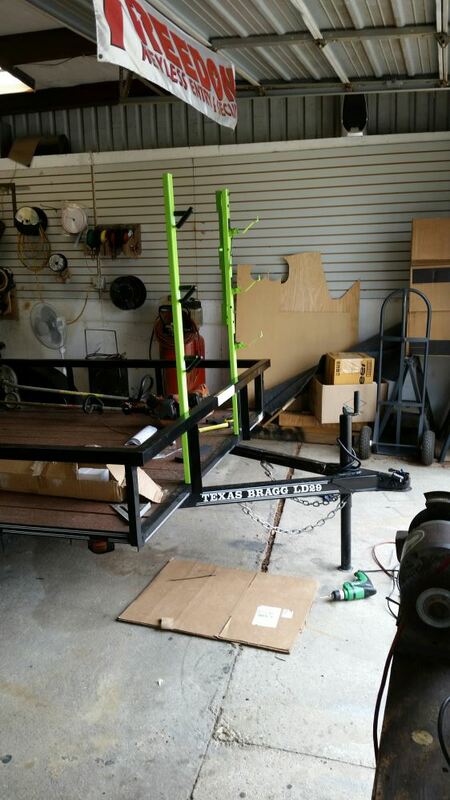 That's going to complete our installation of the Tow-Rax Trimmer Rack for Open Utility Trailers. Part number PXSPDDTR3. 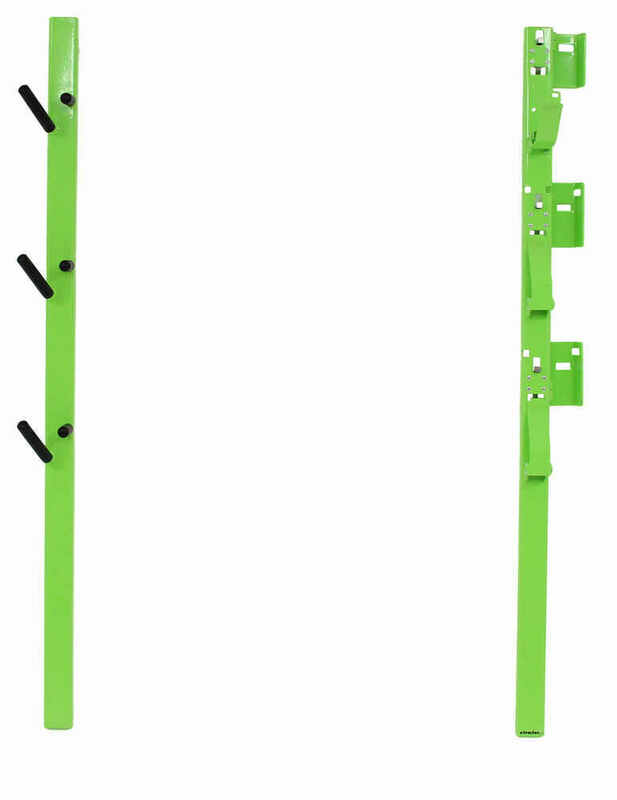 Order: RelevanceNewestRating - High to LowRating - Low to High Storage rack for open utility trailer holds up to 3 trimmers. The trimmers sit horizontally in padded hooks and are secured by a single, lockable security plate (lock sold separately). Individual clasps allow you to remove 1 trimmer at a time. I'd have to see a picture of just how curved the shaft is of your trimmer so it's hard to say if the rack would work or not. 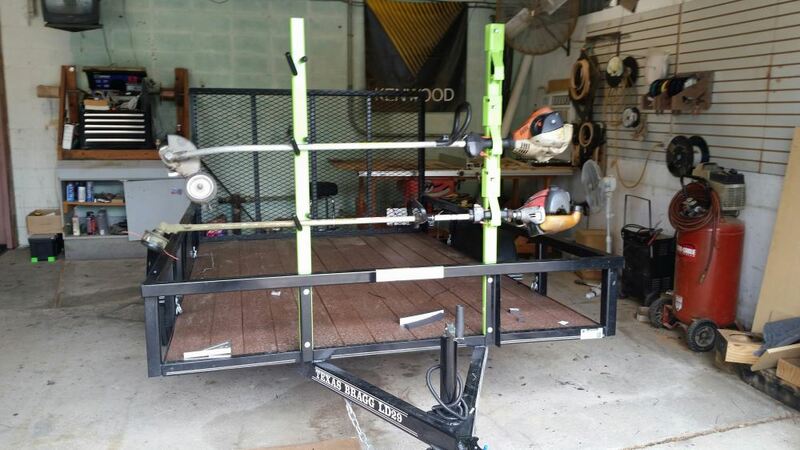 There's no reason the Tow-Rax Trimmer Rack # PXSPDDTR3 couldn't physically install in an enclosed trailer. But your trimmers would most likely be held too close to the walls of the trailer. 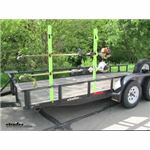 The rack would most likely need to be spaced out away from the walls of the trailer a bit to allow the trimmers to fit and clear.